In addition to nutrition integration that we talked about last month, Healthy Aging is also one of our focuses for this year. We have developed several different programs to achieve this goal, starting with 12 Strategies for Healthy Aging. This is similar to our 12 Habits for Highly Healthy People, but specifically shares tips and advice each month for ways to age healthier. Topics include: Move More, Stress Less, Eat Smart, Balance, Purposeful Aging, Sleep Well, Brain Fitness, Functional Fitness, Be Creative, Stay Connected, Seek Resources, Practice Prevention, and Refine Purpose. You can sign up to receive this information via email or you could attend our “Healthy Aging Exploration Series” to hear the information live from our expert team. Next, we put together a full week of activities for Healthy Aging Week, April 25th-29th. Look for the poster boards and pamphlets to see what activities you would like to participate in. 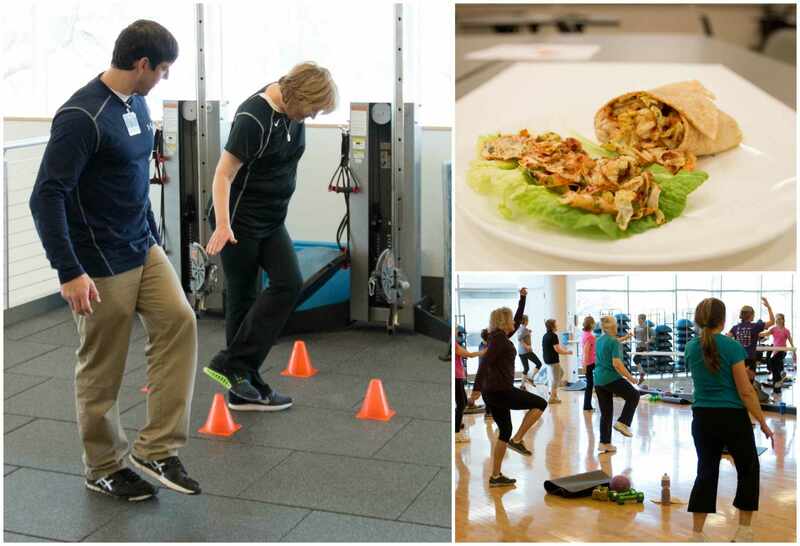 To get you thinking about healthy aging, here are a few of our favorite tips shared at the Exploration Series or in the Healthy Aging Newsletter these past few months. Move. Find a physical activity that you enjoy and do it every day. It can be walking, cleaning your home, a yoga class, swimming, etc. The key is finding an activity you like to do so it doesn’t feel like work or something you dread doing; rather, it’s something you enjoy. Appreciate. Each morning think about 3-5 things you are grateful for in your life and write it down as a nice reminder. Snack smart. Keep cut up vegetables in your refrigerator and put fruit in a bowl so you remember to eat it. Track. Use a pedometer or activity monitor to track your daily movement. Some smart phones have this programmed, or you might need to download an app, like MyFitnessPal, to see the results. Reach for 10,000 steps/day. Create a stress action plan. Make a list of situations, concerns or challenges that trigger your stress and identify what you can do to minimize them. Add flavor. Salt isn’t the only option. Spice up your dishes by substituting different seasonings, such as: lime or lemon juice, balsamic or wine vinegars, or fresh hot peppers or red pepper flakes. Volunteer. Find meaning in new passions by using your work skills in a volunteer opportunity. Color is key. When at the grocery store stock up on fruits and vegetables in a wide variety of colors and then use them to fill half your plate at meals. We hope you will start incorporating these ideas into your daily activities and will see healthy benefits from it. Our next Exploration Series is April 27 5:15-6pm at Charter House and be sure to email RSTWellnessChallenge@mayo.edu to receive their newsletter.